The transformable mobile armor RX-110 Gabthley is an intended mass production unit conceptually developed by Paptimus Scirocco during the Gryps Conflict. Several test units were fielded in combat, with positive results due to its unique design and high performance. In mobile armor mode, the Gabthley is one of the fastest units in the field, and the unique movable frame allows the mobile suit mode's feet to become claws in mobile armor mode, giving the mobile armor the ability to perform limited melee and grappling attacks. Its armament is quite extensive, including a very powerful Feyadeen rifle and a pair of flexibly-mounted beam cannons, making the Gabthley highly effective in both close- and long-range combat. However, the design is deemed too complicated and costly for mass production, and its development is dropped after the test stage. 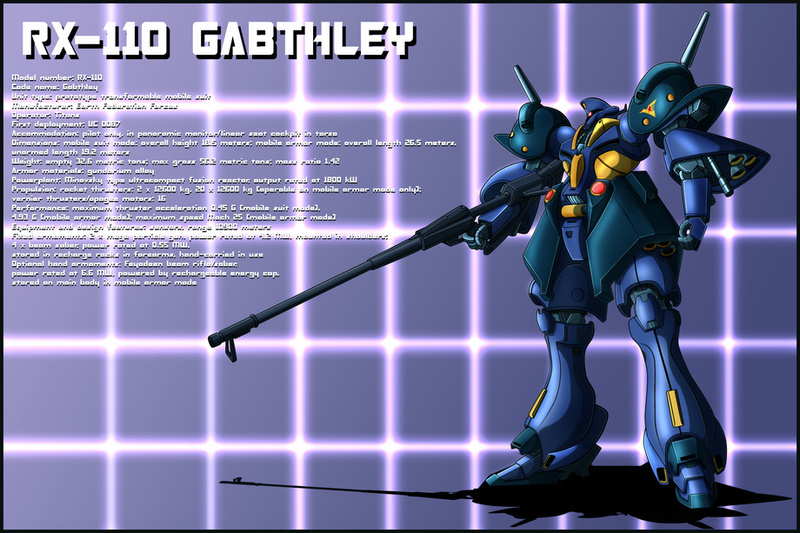 In addition to the regular test units, the Titans create two variants: the customized RX-110C Gabthley [Hugin] and the Cyber Newtype use RX-110NT-1 Gabthley [Munin].